The PlayStation Portable, officially abbreviated PSP, is a handheld game console. In addition to games, have you ever thought of watching movie on your PSP? You might know that PSP can watch video clips, but how to put video to PSP? Well, let's take a brief look at what video formats your PSP support. All movie files you can view on your PSP come with an .MP4 extension. If you want to watch DVD movie on your PSP, you're going to need DVD ripper software to rip the DVD movie to the video format that your PSP support. MacX DVD Ripper Pro is just the program you need to solve this problem on Mac. This simple yet powerful free DVD to PSP converter utility enables you to convert DVD to MP4 and other PSP accepted formats with a few mouse clicks. Follows the instruction below, and you can convert DVD movies to PSP on Mac in 3 steps. Make sure you have the DVD to PSP converter installed. Run this Free DVD ripper software on Mac, then insert your DVD on the DVD-ROM and click "DVD Disc" button to load your DVD or add DVD folder by clicking "DVD Path". In the output format area, select the target format "to PSP". Choose the desired profile among the drop-down profile list based on your PSP. You can also choose the audio/video quality, frame rate, and other parameters according to your own needs. When the settings are done, click the "RUN" button to start conversion. The converting speed depends on the file size of DVD movies and your CPU. New movie DVD releases are all supported. When the DVD to PSP MP4 conversion finished, you can freely transfer movie to PSP and watch movie on PSP anytime and anywhere you like. This tool also allows you to convert DVD to more video formats that can be enjoyed by Mac, QuickTime, iPhone X/8/7/Plus, iPod, iPad Pro, Galaxy S9/Note 8, PSP, etc. Notice: We only advocates using this best DVD ripper to rip commercial DVDs to PSP MP4 under the concept of Fair Use and does not encourage any illegal reproduction or distribution of copyrighted content. Please abide by the local DVD copyright law before doing it. 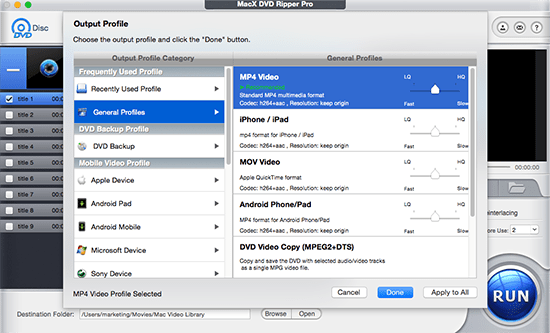 How to use Mac the Ripper to rip DVD to iPad, iPhone iPod on Mac? MacTheRipper User guide article. You will learn from the tutorial how to rip DVD to VOB files and convert VOB files to video that compatible with iPad, iPhone, iPod etc.